This recipe for Mango Ketchup is from "The Great Mango Book" by Chef Allen Susser (Ten Speed Press). This tomato-less ketchup is made with mangos and spices cooked down to a velvety consistency. It makes a great condiment to serve with pork, seafood, and poultry. The ketchup needs to stand overnight to let the flavors blend before using, so plan accordingly. For a history of ketchup, see the information after the recipe directions, below. This recipe calls for raw sugar. Raw sugar is sugar that hasn't been processed into white sugar so its natural molasses content is intact. It's similar to brown sugar, except its flavor is lighter and the is more coarse (almost like kosher salt). Recipe reprinted with permission from The Great Mango Book by Chef Allen Susser (Ten Speed Press). Peel 4 medium mangos (see the Chef's Note, below, for tips on peeling mangos) and discard the center pit. Remove pulp and purée in food processor or blender. Add 2 ounces vinegar, 1 tablespoon ground ginger, 1/8 teaspoon ground cinnamon, 1 teaspoon salt, 1/2 cup raw sugar, 1/2 cup white wine, 1/2 teaspoon ground allspice, 1/2 teaspoon cayenne pepper, and 1 whole clove. Purée until well combined. Pour the purée into a heavy saucepan and cook over low heat until the mixture has reduced and thickened. Remove from the heat and allow to cool. Strain the mixture through a fine sieve. Refrigerate overnight to allow the flavors to meld. 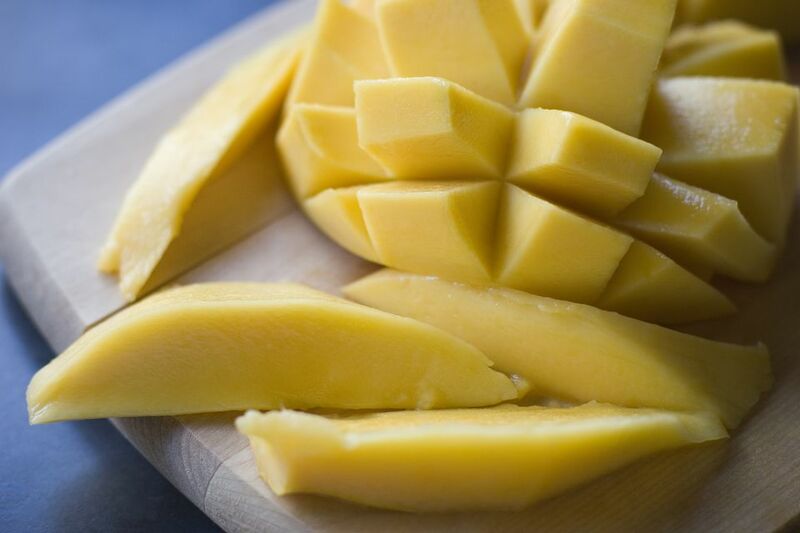 Chef's Note: Peel the mango, using a very sharp knife, as if it were a potato. Lay the fruit flat on the counter and slice lengthwise above and underneath the large seed. Trim off any fruit remaining on the seed. Discard seed and skin.